Have you started to notice a small rash on baby’s skin? If so, it could be a sign of eczema. Eczema in babies is actually pretty common. It’s estimated around 20% of infants and toddlers develop the condition, with around 65% developing it within their first year. Usually, the condition will disappear on its own eventually, but it can cause discomfort for baby and a lot of worry for you! So, what exactly is baby eczema and does it need to be treated? Below you’ll discover everything you need to know. 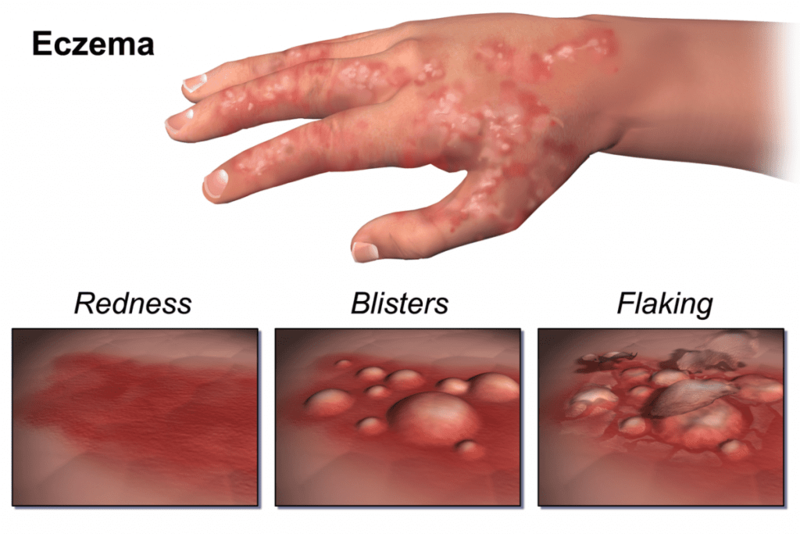 Eczema, also known as atopic eczema, is a common skin condition which is largely known to affect adults. However, it’s also quite common in babies; usually starting once baby reaches at least two months of age. The skin appears dry, red and sometimes crusty. In some cases, it can also bleed or ooze fluid. However, this only tends to really occur after it has been scratched. So, if your baby is still quite young, they won’t have the ability to scratch it, meaning oozing and bleeding shouldn’t be an issue. Baby eczema isn’t serious, though it can look pretty nasty which is what causes parents to worry when they discover the condition. You’ll notice it comes and goes through your child’s life too. The good news is, it will typically clear up on its own, though this may not happen until your little one is in their teenage years. The condition causes issues with the skin’s moisture barrier, which is why it appears dry. It also makes the skin a lot more susceptible to infections and allergens; in turn making the eczema worse. While it isn’t a contagious skin condition, it can cause baby a lot of discomfort due to consistent itching. Therefore, it is recommended you seek out treatment to ensure your little one is comfortable. It’s also worth noting there are a few different types of baby eczema, so diagnosis is needed to establish which type your little one has. As of yet, the actual cause of eczema isn’t known. However, it is thought to be hereditary so if either parent has the condition, baby is more likely to get it too. You’ll also notice that at certain times, the condition appears to worsen. It can become inflamed and appear redder than usual. This is caused by allergens which, as mentioned earlier, find it easier to get into the skin due to the presence of eczema. Once allergens come into contact with the skin, the immune system kicks in to try and eliminate them from the area. In some cases, flare ups can be caused by certain chemicals, or by something in baby’s diet. So, you may notice the detergent you use, or shampoos and baby wash can make the problem worse. Diet is rarely the cause of a flare-up, but it’s worth getting advice from your pediatrician for peace of mind. Though baby eczema can appear practically anywhere on the body, it does tend to start on the scalp or cheeks in the early infant years. After one year of age however, it’s most commonly found on backs of baby’s knees, or on the inner part of the elbows. There is no set route the condition takes, so the above should be used as a rough guide only. Moisturizer – You can take care of the dryness by applying a non-perfumed moisturizer to the affected area. This should be done several times a day and applied in a downward motion. There are a number of different moisturizers and creams out there designed for babies, but some of them can actually make the condition worse. For example, you’ll want to avoid using aqueous cream as it has been discovered to cause itching, stinging, burning and additional redness. It’s a good idea to get advice from a doctor on which moisturizer would be better suited to baby’s skin. Ointment – Sometimes ointment is a better solution than moisturizer due to its additional moisture-locking benefits. It’s especially good to apply it to areas exposed to baby’s drool. This is because the drool can further dry out and irritate the skin, so the ointment creates a barrier to prevent this happening. However, it’s worth avoiding ointment during the hot, summer months as it can lead to prickly heat. Effective moisturizers, creams and ointments can be browsed by clicking here. Limit Exposure To Allergens – Allergens are known to make baby eczema a lot worse, so it helps to identify the ones which typically affect your baby. It could be dust mites, pollen or pet hair for example. You can use a journal to identify your little one’s allergen triggers, using it to write down when the eczema flares up and what baby was doing or surrounding by at the time. Many babies are particularly sensitive to dust mites. These can build up on baby’s toys, as well as on their bedding. So, it’s worth washing them at around 140 Degrees Fahrenheit once a week. Alternatively, you can also place them in a bag and store them in the freezer for 24 hours. This will also kill off any dust mites. Avoid Certain Fabrics – Certain fabrics can further irritate the skin such as nylon and wool. Cotton is generally the best fabric to use; especially during a flare-up of the condition. Usually, the above is enough to keep baby eczema at bay. However, if your little one has a particularly bad case of eczema, they may need a steroid based cream. These should only be used under the advice of your doctor or pediatrician. So, above you discovered what you can do to treat and soothe baby eczema. But what about the things you should avoid? Firstly, you’ll want to avoid the use of cleansers. These have the potential to dry out the skin even more, causing added irritation. It’s also a good idea to avoid giving baby hot baths. Instead, make sure the water is warm. Finally, shampoos, baby wash and any soaps used should also be dye and fragrance free. 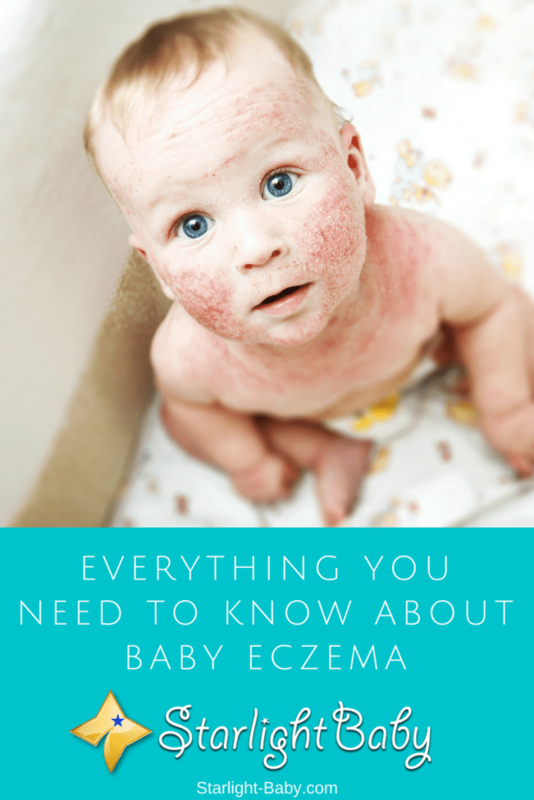 Overall, baby eczema is common and it usually isn’t anything to worry about. However, you will need to treat it in order to ensure baby is comfortable. Always talk to your doctor or pediatrician before starting any type of treatment to establish the cause of and the type of eczema they might have. It hurts me to even see these pictures or to imagine a baby having to go through this! I know that we all want our little ones to be as healthy as possible but it’s the truth – many, sadly, aren’t. Therefore such articles are amazing to read and to be prepared on how to deal with such situations. I am very blessed because my boy hasn’t had any eczema problems, however, I sort of know a girl that has it. She’s in her twenties and has been battling it on and off for a while now. She has great periods where her skin is very clear then all of the sudden eczemas reappears. It really affects her self-confidence. If I understand correctly eczema that babies have is a bit different than the ones adult get or? Actually yes. In babies most times, the symptoms of eczema can become drier and could be accompanied by flaky rashes. While in adults, there could be presence of some leathery or scaly patches of eczema. Wow! It is my first to read this skin condition. Very informative. This is very informative. I saw some babies has this skin problems. My friend daughter has this skin conditions. She didn’t mind it too much as it comes and go. She just put some moisturizer. What bother me most is her daughter is scratching it making it look worst and I know it will leave some scar when she gets old. This article might help her deal with her daughter skin problem. Yes, rose, eczema can be really irritating. Poor kid. Yes, please share this article to your friend. We really hope it could help her and her daughter deal with the skin condition. Well, as a scientist and with my knowledge of eczema, diet is rarely the major cause of eczema, but could play a part in some cases. However, the causes of eczema are not fully understood. But depending on the severity of it on the baby, a lot of times, treatment at homes have been proven to be successful. Changes is temperature, reactions to a specific food, skin irritants, dust mites could flare up eczema in children. Proper bathing, moisturizing the baby, and with the application of prescription treatment could be very effective. Ointment on the other hand, is a widely used treatment method for eczema because of its additional moisture locking benefits on the body. Sounds good, Dparagon. Thanks a lot for sharing this information. quite informative but it can be worrisome for a new mom to experience this with a baby. I have a four months old child. The statistics you have presented in the first few paragraphs alarmed me. On the day when my baby was born, his skin was perfectly fine. However, on the second day, there were some rashes. I thought it was an allergic reaction to the environment, which was very new to the baby. When the rashes increased on the third day, I was very worried. The doctor said we should wipe the baby with antiseptic lotion and the rashes were gone in few days. When I was still breastfeeding, my baby had some skin rashes or the doctor said, a mild eczema. It was because of the foods I ate like eggs, chicken and some nuts. The doctor advised me to stop for a while and I noticed the rashes of my daughter also went gone. It really would affect the baby when you are breastfeeding. Mild moisturizers and ointments really helped though. I totally agree with you on the assertion that this is a very common thing when it comes to kids/toddlers, there isn’t much need for a parent or guardian to worry too much about Eczema, unless it’s in cases of severe ones. I’m glad to hear that ointment and moisturizers can help cure Eczema. They aren’t anything that is going to cause any harm to babies, so therefore, I definitely believe it’s worth using to help reduce the discomfort Eczema causes to babies. The pictures I saw above makes it hard for to imagine my future kids passing through such pain, but as we are humans, these are some of the sickness we might find hard avoiding and that’s where your article on how to reduce the pains felt by these innocent babies at the early stage of life mild. I’m grateful for I learnt so much on how I can manage such situation, if it happens in my family in the future. This is a very good information contained in this article, the positive side about baby Eczema that I appreciated learning here is that it isn’t contagious but still needs to be treated, as it poses a lot of discomfort to the baby. Baby’s skin are too tender to allow pass through the itching and discomfort of suffering from Eczema for a long period of time. It’s nice having to know that ointments and moisturizers are capable of treating Eczema.